Munoz: "We're receiving a lot of accolades on the new Maxima, including from our dealers." NASHVILLE -- As Nissan Motor Corp.'s North American chairman, Jose Munoz has responsibility for sales, marketing, design, engineering and manufacturing in this region, where the automaker's market penetration is its highest in the world. Nissan has been racking up achievements, with increased sales, increased market share and rising dealer profitability. 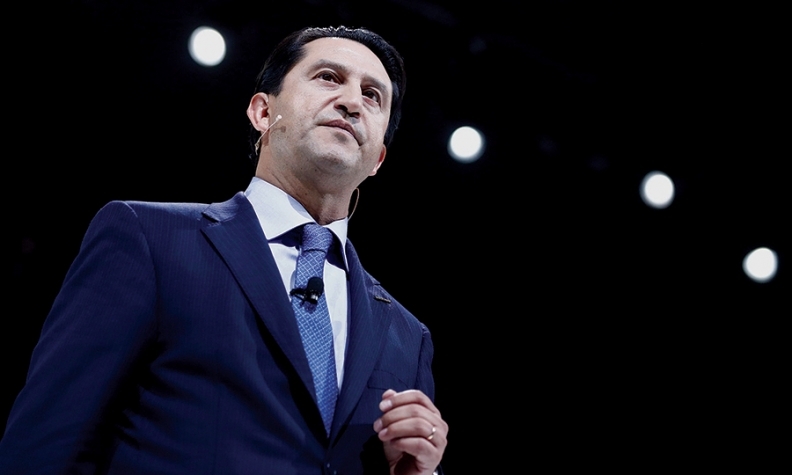 But Munoz, 49, faces a difficult assignment: He must take Nissan and Infiniti to a combined 10 percent U.S. market share by March 2017, up from 8.4 percent at the end of 2014. He spoke in his office near Nashville with Staff Reporter Lindsay Chappell. Q. What is Nissan's U.S. sales outlook for 2015? A. All the signs we get from the market are positive. We believe the market will be somewhere around 16.7 million in the U.S., and some analysts believe it could get as high as 17 million. The redesigned 2016 Maxima arrives as the large-sedan segment is shrinking. What will happen? One thing that's happening lately is the decline in fuel prices. That's making people a little more interested in bigger vehicles, and that's an opportunity for the Maxima. But I also remind you that when consumers see new products in the market that are appealing, there will be shifts in the market. We're receiving a lot of accolades on the new Maxima, including from our dealers. So we're very bullish about the car. Where is Nissan's market-share growth coming from? The biggest bulk is still coming from our import competitors. But we also see more and more consumers coming from all OEMs, namely Ford and Chevrolet. But it is a fiercely competitive environment. Some of our former customers are going to others in the marketplace. The key for us is to increase loyalty and to continue to work on conquest in a very controlled manner, so that the finances of the company are stable. How much more profitable are Nissan's dealers today than before? We're making very strong progress. For the past two years combined, dealer profitability has increased by 29 percent. Some dealers have made way more than others, but that's the average. But I have a strong belief that it's not about the OEM becoming more profitable by eating the profits of the dealers, or the dealers more profitable by eating the OEM's profits. I want both the dealers and Nissan itself gaining, and that's happening. I meet with the dealer advisory board every month to talk about our profitability and how we can do better. We believe that profitable and motivated dealers will help us win a larger dealer share of mind. So far, so good. But there is still a lot of room for improvement on both sides. Nissan Motor's goal is to reach a 10 percent U.S. market share by March 2017 but fewer than 24 months remain to get there. How will Nissan do it? We're making strong growth. In our fiscal year that just ended March 31, we managed to overtake both Honda and Ford in cars for the year -- we were traditionally behind them. This gives us confidence that if we do the right things and get the right products, we'll continue to grow. In trucks, we've begun getting the supply we need, and we have a new Titan coming. We also have a new Maxima that just launched. Good products are the best ally we have. I'm very confident we will hit our goal. But I'm not obsessed with the number. We don't want to just hit 10 percent and that's it -- we want to continue to grow beyond that. The Nissan group finished the fiscal year with a 9.2 percent share for all North America, which was an increase of 0.4 percentage points. This region is the highest market share in the world for the company. Nissan brand has 8.6 percent, which is the highest share for the brand worldwide. So the number is really in reach if we continue to do our job. We have a very concrete plan, and our people know what to do. I'm not losing sleep over it. Last year the Nissan Sales Growth Program replaced the controversial stair-step programs of the past. How has the new system worked? It's been very positive and a significant step up for Nissan, especially considering where we were in the past. When I came to the United States, all dealers -- public, private, large and small -- told me our stair-step program was not good, and it was having a negative impact on their profitability. We put a lot of time and effort into creating a new program that would appeal to everyone and allow all dealers to sell more and to make more money. Is there still room for improvement? Yes, and we've continued to work with the dealers to improve it. On April 1, we launched a number of enhancements to the program. They incorporate the feedback we've gotten from dealers on how we can do it better. It aims to give the dealers visibility of more than one month for planning. They will now have more than one year to plan their sales, and we can plan our production and supply. We have included some additional features that the dealers asked for. Some dealers say that Nissan's goals are just too hard -- that they can't achieve what the company wants. I have a very simple principle in business, which is that you grow or you go. In all aspects of the business, if you don't plan for growth, you're going to drop. Some dealers feel more comfortable than others. In this region, we sold 181,000 more vehicles than we sold the previous year. So there is definitely growth for everybody -- nobody is expected to remain stable. The discussion is more about the growth rate rather than anything else. The U.S. is such a big country with so many elements that you get states that are growing way more than the average. When you're sitting in your town, you may not realize this. When we share the data, it surprises people. Another factor is our expected growth. For instance, in the past we were not a strong player in compact SUVs, which is the segment that's growing the most. That's no longer the case. We now have many dealers who are selling more Rogues than Altimas, and they never thought that would happen. And we also expect to step up in full-size pickups, and we'll have a new Titan this year. We've been a very small player there, but we believe we can have 5 percent of that segment. Some dealers voice objections about this. And yet some of the ones who voice them the most are the highest achievers. I'm in constant communications with some dealers, and there is one in particular who frequently tells me, "Your objectives are very high." I just asked him what his results were, and he had achieved 120 percent. In that philosophy of "you grow or you go," should underperforming Nissan dealers go? If your brand is growing and all the dealers around are growing and you're not, you should ask yourself why. In the few cases we have like this, we've had positive results. We have a process by which we try to understand what's happening. It can be a matter of a lack of planning. Or there can be simply personal issues. People can make the difference. We've seen significant turnarounds on existing operations just by a change in executive management. But if the market around you is growing, shouldn't you be planning for growth? What was involved in the transfer of the Van Tuyl Nissan and Infiniti stores to Warren Buffett and Berkshire Hathaway? I've been a big follower of Mr. Buffett for many years, and I know Larry Van Tuyl personally. I trusted that when they came to this conclusion they knew what they were doing. Larry has done a great job for Nissan and his stores are about the best performing in the country. It's good to know that he will still be around. It has been very good for us. I wish all the best to their group. Will Berkshire Hathaway buy more Nissan Motor stores?